Felix Maria Woschek, „a singer whose devotion touches and inspires every heart. The Sufi way of enlighting ecstasy and inward change“. Hindu bhajans and Islamic mantras sung by Felix Maria and Elke Woschek transport the listener into a mystic state of vibration of the heart. Together with the versatile musician Raimund Engelhardt (tabla, frame drums, santoor, rabab, bamboo flute) and J. Egert (sarod, dilruba) and G. Bänfer (shawm, saxophone), we set off on a musical and spiritual journey from India and Afghanistan to Morocco. A new music is created at the point where orient meets occident, meditative and spirited, allowing us to participate in the mystic joy and devotion of the seeker after God. Felix Maria Woschek, the musician who lives in Freiburg, as already produced and published his own small series of CDs which are without comparison if only on account of their appearance. In addition to this, there is a musical experience in store for the listener the sheer depth of which he or she can only perceive after listening to it for a number of times. Woschek defines himself as a multi-cultural artist; his music is intended to be a message of peace and testimony to the all-unity of mankind, Nature, and the cosmos. In his music he blends sacred songs form the world religions and presents them mainly in the so-called bhajan style. Woschek and his fellow-musicians regard their music as a bearer of light, love, and peace. The danger that the mantras presented here, which are after all meant to be recited inwardly, drift away into the banal area of kitsch, certainly does not exist in the case of the „Mystic Dance“. 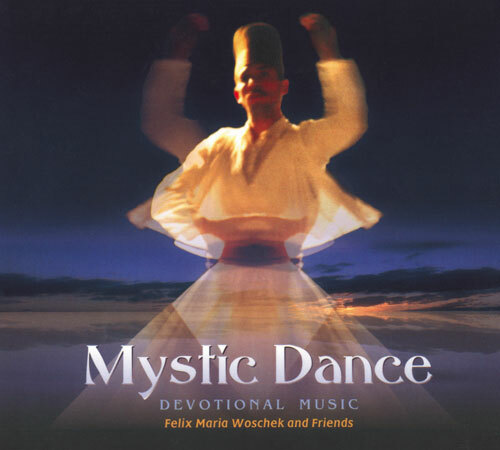 „Mystic Dance“ is borne along by the throbbing of the divine, and is in my opinion an important contribution to spiritual understanding between the peoples of the world. Woschek’s latest CD, „Karuna“, contains four longer pieces described as „Devotional Songs“. One point deserving special mention is the collaboration of the world-famous Sultan Khan (vocal and sarangi), which inevitably gives „Karuna“ an Indian touch. The four pieces are remarkably intensive and filled with the Spirit of the Highest.